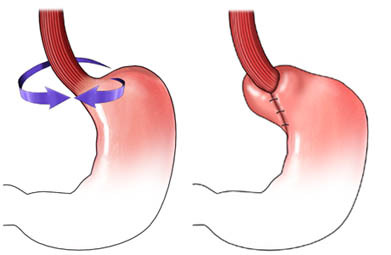 Fundoplication is surgery to wrap the upper stomach around the lower esophagus. It makes backing up of acid into the esophagus from the stomach less likely. A wide incision will be made in the abdomen. This is to expose the stomach and lower esophagus. The upper portion of the stomach will be wrapped around the esophagus. This will create pressure on the lower part of the esophagus. It will reduce the chance of stomach acid moving up the esophagus. If a hiatal hernia exists, the stomach will be placed entirely back in the abdomen. The opening in the diaphragm where the hernia poked through will be tightened. You will have discomfort during recovery. Ask your doctor about medication to help with the pain. It will take about 6 weeks to recover. Gastroesophageal reflux disease. EBSCO DynaMed Plus website. Available at: http://www.dynamed.com/topics/dmp~AN~T116914/Gastroesophageal-reflux-disease-GERD . Updated December 4, 2017. Accessed January 10, 2018. Nissen fundoplication. MUSC Health Digestive Disease Center website. Available at: http://ddc.musc.edu/public/surgery/laparoscopic/fundoplication.html. Accessed January 10, 2018.